From the bustling street corners of Toronto to the parched savannah of rural Zimbabwe, MBIRA TALKS follows Zimbabwean-Canadian Moyo Rainos Mutamba (Moyo) as he uses the sacred Zimbabwean musical instrument Mbira to reconnect with indigenous knowledge. AS A CHILD, MOYO WAS A VORACIOUS LEARNER who would read for hours in the mountain caves of Madhege, Zimbabwe, where he would hear the rock rabbits - the Mbira’s namesake - call to one another over long distances. Like the rock rabbits, Mbira is also known for its call and response over distances and through time: connecting the player and the ancestors. Although Moyo grew up after independence in 1980, he still experienced the in uence of the colonial regime, with echoes of fear presiding over traditional beliefs and practices. During that era, the threat of imprisonment by the colonial government prevented Zimbabweans from congregating for spiritual ceremonies, and playing Mbira was banned. Local missionaries called Mbira music “Satan’s work,” and multiple generations were educated in missionary schools that taught them to discredit and fear their heritage. Moyo is just one part of a modern movement of Zimbabweans - both abroad and at home - who are using Mbira to reconnect with their indigenous knowledge and traditions. The ideologies of both Zimbabwe and Canada combine at Zimbabwean music camps such as those held at O.U.R. 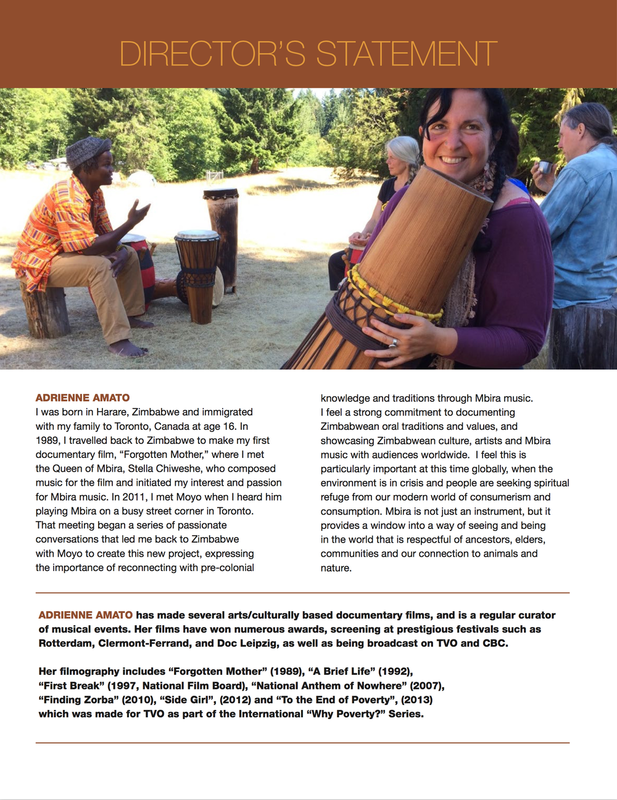 eco village on Vancouver Island, where mbira is openly taught and celebrated by Zimbabweans and North Americans. Each year Moyo returns to Ubuntu, upgrading the community’s independence through solar power and permaculture that he has learnt about in Canada. Family and village members who once feared Mbira are now learning to play the instrument together. While in Zimbabwe, Moyo continues to reclaim both his personal and collective history, which he in turn helps spread throughout the world. This physical interchange of ideas and knowledge across continents in the face of harsh suppression is a striking example of the enduring power of oral knowledge and traditions. Mbira Talks documents this unique exchange of ideas, histories, and cultures between Canada and Zimbabwe.